How Long Before Napa Cabs Top $1000 A Bottle? Mending Wall Winery in St. Helena, where the wines are produced, has not been affected. The winery is the partnership of three winemaking families: Pulido~Walker, the Dotzlers, and Thomas Rivers Brown. The 2016 and 2017 vintages are safely stored in barrels at Mending Wall, and the 2015 vintage of Pulido~Walker single vineyard designate wines are resting in bottle for release in early 2018. The warehouse in American Canyon where their wine is stored has not been impacted. In addition, Pulido~Walker’s two other vineyard sites, Melanson Vineyard on Pritchard Hill and Panek Vineyard in St. Helena, thankfully have not been touched by the fires. 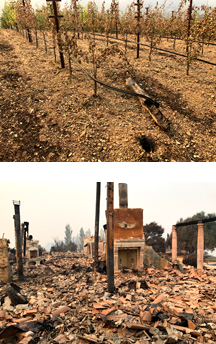 Sadly, the Napa Valley Partrick Fire completely destroyed Mark and Donna’s estate home and gardens on Monday, October 9. The Pulido~Walker Estate Vineyard on Mt. Veeder suffered partial damage, according to initial photographs from the site, which may impact the planned 2018 inaugural harvest. If you would like to assist the Napa community, please join Pulido~Walker in making a contribution to the Community Foundation of Napa Valley relief fund that is helping local nonprofits aid fire victims with food, temporary housing, medical and mental health care, childcare, and livestock and animal care. We are pleased to share with you some news about Pulido~Walker.